Giosuè Carducci was an italian poet, writer and literary critic born in 1835. He won the Nobel Prize for Literature in 1906 a year before his death. He was at a certain tile the most famous poet in Italy. He embodied the hope of a generation and sang in classical meters of mythic visions that connected the Italian landscape to its roots in the ancient world. His poetry, criticism, and translations ran to a score of volumes. It was in his late volume, Odi Barbare (1877–1899), that he arrived at a transcendent, death-marked music. To my ear, a kind of Symbolist sonority emerges as the poems counter Romantic impulses with classical poise. It is not always easy to follow the development of Carducci's poetry through the collections he edited. 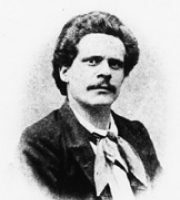 The poet in fact organized his compositions several times and in different ways and gave a definitive arrangement only later in the edition of his Opere published for Zanichelli between 1889 and 1909.